Professor Rod Ellis, gave a presentation which is available on YouTube.com. In it, he focuses on written corrective feedback. I’ve written a basic summary below. Get a drink, a snack, your notebook, make yourself comfortable and enjoy an allusive, informative explanation of the current state of affairs regarding written corrective feedback; the types and strategies, what we know, what we don’t know and what we should do. Why do we give written corrective feedback? Advantage – Provides learners with explicit guidance about how to correct their errors. Ferris and Roberts (2001) suggest direct written corrective feedback is probably better than indirect written corrective feedback with writers of low levels of language proficiency. Disadvantage – It requires minimal processing on the part of the learner and thus, although it might help them to produce the correct form when they revise their writing, it may not contribute to long-term learning. However, a recent study by Sheen (2007)* suggests that direct written corrective feedback can be effective in promoting acquisition of specific grammatical features (Low intermediate level learners). * The effect of focused written corrective feedback and language aptitude on ESL learners. Involves indicating that the learner has made an error but without actually correcting it. This can be done by underlining the errors or using cursors to show omissions in the learners’ text or by placing a cross in the margin next to the line containing the error. In effect, this involves deciding whether or not to show the precise location of the error, i.e. just indicate which line of text the error is on. The results of studies that have investigated direct vs. indirect written corrective feedback are very mixed (cf. Lalande 1982 and Ferris and Robert’s 2002). No study to date (2012) has compared the effects on accuracy in new pieces of writing. Provides learners with some form of explicit comment about the nature of the errors they have made. Use of error codes, i.e. abbreviated labels for different kinds of errors placed over the location of the error in the text or in the margin. e.g. art = article, prep = preposition, sp = spelling, ww = wrong word, t = tense, etc. Metalinguistic explanations of their errors, e.g. numbering errors and providing metalinguistic comments at the end of the text. Informal poll: learners were in favour of metalinguistic explanations but teachers were not. Rod Ellis suggested that it had something to do with hard work on the teachers’ part. Lalande (1982) – A group of learners of L2 German that received correction using error codes improved in accuracy in subsequent writing whereas a group receiving direct correction made more errors. However, the difference between them was not statistically significant. Robb at al (1986) – The use of error codes no more effective that three other types of written corrective feedback they investigated, i.e. direct feedback and two kinds of indirect feedback. Ferris (2006) – Error codes helped learners to improve their accuracy over time in only two of the four categories of error she investigated, i.e. in total errors and verb errors but not in noun errors, article errors, lexical errors or sentence errors (e.g. word order errors). Ferris and Roberts (2001) – Error codes helped learners to self-edit their writing but no more so than indirect feedback. Overall then, there is very limited evidence to show that error codes help writers to achieve greater accuracy over time and it would also seem that they are no more effective than other types of written corrective feedback in assisting self-editing. This is less common than error codes. It’s time-consuming and calls for the teacher to be able to write clear and accurate explanations for a variety of errors. Sheen (2007) compared direct and indirect metalinguistic written corrective feedback. Both were effective in increasing accuracy in the learners’ use of articles in subsequent writing completed immediately after the written corrective feedback treatment but the metalinguistic written corrective feedback proved more effective that the direct written corrective feedback in the long term, i.e. in a new piece of writing completed two weeks after the treatment. Rod Ellis speculated that metalinguistic written corrective feedback forces learners to formulate some kind of rule about the particular grammatical feature and then they use this rule but it takes time for them to be able to use this rule effectively. Direct feedback might have an immediate effect but learners soon forget the correction, whereas if they’ve learned the rule, maybe it’s going to have a longer term effect on learners’ ability to avoid the errors. addresses a range of errors, so while it might not be as effective in assisting learners to acquire specific features as focused written corrective feedback in the short term, it may prove superior in the long term. The distinction of focused and unfocused written corrective feedback applies to all of the previously discussed options. The bulk of written corrective feedback studies completed to date have investigated unfocused written corrective feedback. Sheen (2007) – Focused written corrective feedback, i.e. errors in the use of articles for the first and second mention, proved effective in promoting more accurate language use of this feature. However, to date (2012), there have been no studies comparing the relative effects of focused and unfocused written corrective feedback. Extensive corpora of written English can be exploited to provide learners with assistance in their writing. Electronic resources provide learners with the means where they can appropriate the usage of more experienced writers. Learners consult the electronic resources to compare their usage with that illustrated in the samples of language made available. This assists learners to self-correct. There has been no research to investigate whether this is effective or to investigate whether it has any actual effect on language acquisition, as measured in new pieces of writing. This involves native-speakers rewriting learners’ texts in such a way as ‘to preserve as many of the writers’ ideas as possible, while expressing them in their own words so as to make the pieces sound native-like’ (Cohen 1989: 4) The writers then revise their writing by deciding which of the native-speakers’ reconstructions to accept. In essence then, reformulation involves two options ‘direct correction’ + ‘revision’ but it differs from how these options are typically executed in the whole of the learners’ texts are reformulated thus laying the burden on learners to identify the specific changes that have been made. This study compared reformulation and direct correction. Learners were shown their reformulated/corrected stories and asked to study them for 20 minutes and take notes if they wanted. One day later, they were given a clean sheet of paper and asked to revise their stories but without access to either the reformulated/corrected texts or the notes they had taken. Both the reformulation and direct correction groups outperformed a control group. However, the correction group produced more accurate revisions than the reformulation group. It should be noted, however, that reformulation serves also to draw learners’ attention to higher order stylistic and organisational errors. Rod Ellis notes that learners may only look at their grade and nothing more if they aren’t required to study their corrected texts. 80.4% were eliminated in the redrafted compositions either by correcting the error or by deleting the text containing the error or by making a correct substitution. Error corrected Error corrected per teacher’s marking. Incorrect change Change was made but incorrect. No change No response to the correction was apparent. Deleted text Student deleted marked text rather than attempting correction. Substitution, correct Student invented a correction that was not suggested by the teacher’s marking. Substitution, incorrect Student incorrectly made a change that was not suggested by the teacher’s marking. Teacher-induced error Incomplete or misleading teacher marking caused by student error. Averted erroneous teacher marking Student corrected error despite incomplete or erroneous teacher marking. But no research has addressed this issue. However, this study cannot be used to claim that written corrective feedback with revision contributes to L2 learning as there was no control group, i.e. a group that received no written corrective feedback. Rod Ellis notes that a great weakness of studies that have investigated written corrective feedback is that the studies have had no control groups and this makes it very difficult to say whether the written corrective feedback is actually having any effect on learning. Hyland and Hyland (2006) commented, ‘it may be … that what is effective feedback for one student in one setting is less so in another’ (p.88). A sociocultural perspective on written corrective feedback would emphasise the need to adjust the type of written corrective feedback offered to learners to suit their stage of development (Aljaafreh and Lantolf 1994) although how this can be achieved practically remains unclear in the case of written corrective feedback. Teachers need to consider the various options and formulate an explicit policy for correcting errors in learners’ written work. They also need to subject their policy to evaluation by evaluating the effects of their error correction, e.g. through action research. There is an obvious need for carefully designed studies to further investigate the effects of written corrective feedback in general and of different types of written corrective feedback. Guenette (2007) observed that is is important that studies are conducted in a way that make them comparable but sadly that has not typically been the case. A typology of written corrective feedback provides a classification of one of the key variables in written corrective feedback studies – the type of written corrective feedback – which can serve as a basis for research. Are Flash and HTML5 locked in a mortal struggle for control of the internet? It’s a loaded question, isn’t it? The kind of attention grabbing headline we’ve come to expect from the mainstream media who receive a substantial portion of the $691,000,000 (2010) of Apple Inc.’s annual marketing budget. So what of this epic struggle between Adobe’s flagship software platform and the open source, open standard HTML5? HTML was born* in 1995. CSS was born in 1996. Flash was born in 1997. * By “born” I mean the first working versions of the respective languages and runtimes were released to the public, i.e. 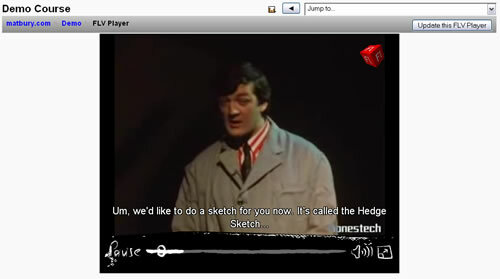 HTML 2.0 and Flash Player 2.0. HTML is open specification and great for flexibility and accessibility. HTML text flows naturally across the screen, browsers can apply anti-aliasing to make it smoother on the eye, the text can be resized (Ctrl + mouse wheel) which is perfect for the sight-impaired, assistive technologies can convert the text to speech for accessibility, etc. In short HTML is wonderful for everyone. CSS (Cascading Style Sheet) defines the physical appearance (look and formatting) of web pages, for example defining text fonts, sizes, colours and styles, the arrangement of areas of text, images and other elements on the page. In short, they’ve all had a long and productive history together and they’ve all contributed to making the web a richer, more enaging, more accessible medium. At one time or another, they’ve all had their critics and predictions of their demise. 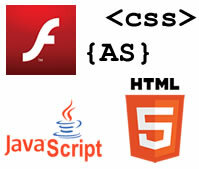 Will HTML5 kill Flash? More likely, HTML5 will gradually replace HTML4 and some but not all of what Flash currently does. No killers, no victims and not very sensational after all.